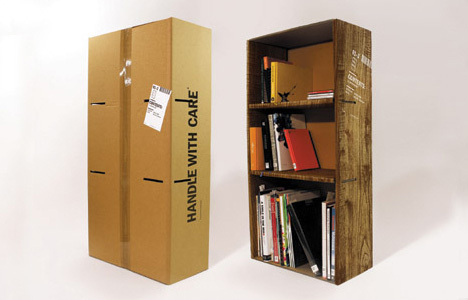 Idea* is a concept project, commenting on the value of waste packaging and the perception of contents. Each box claims to contain a product, but instead can be deconstructed and reconstructed inside out to become its intended contents. After construction it forms a functional product and also a memorable reminder of how little we appreciate the bland, brown cardboard box. This product is a cardboard construction which opens and constructs into itself, creating the shelf or chair or whatever it says it is on the box. Design/ “Idea* is a Tim Brown’s self-initiated final year student project, commenting on the value of waste packaging and the perception of contents. Each box claims to contain a product, but instead can be deconstructed and reconstructed inside out to become its intended contents. After construction it forms a functional product and also a memorable reminder of how little we appreciate the bland, brown cardboard box.